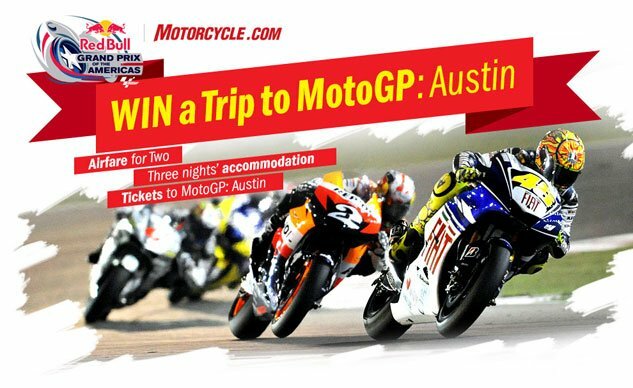 The 2014 MotoGP season is nearly upon us, and we're offering our readers a chance to watch stars like the reigning World Champion Marc Marquez, former champion Jorge Lorenzo or the legendary Valentino Rossi race live in the 2014 Red Bull Grand Prix of the Americas in Austin, Texas. Simply complete our 2014 Motorcycle.com Reader's Survey, and you could be watching the MotoGP World Championship at the Circuit of the Americas. One lucky entrant will be selected at random to receive the grand prize which includes airfare and accommodations for three nights and a three-day pass for the April 11-13 Red Bull Grand Prix of the Americas (an estimated $3000 value). The contest is open to residents 21 and up, from the 50 States, the District of Columbia or Canada. The winner will be selected on or around March 31. Head over to our survey page to enter or read the full contest rules. Our thanks to everyone who participates, and to the lucky winners. But if you don't win the prize, fear not we'll have more contests and other prizes coming.